For a number of applications – such as tight openings in drums, or other complicated reeving systems – there may be a need for making special end preparations. When these are required, there are about four basic designs (and combinations) to choose from (Fig. 27). Whenever possible end preparations should be removed after the rope is installed. Beckets are used when another rope is needed to pull the new rope into place. Wire rope should not be shortened, lengthened or terminated by the use of a knot. Figure 27. Beckets, or end preparations, are used on wire rope ends when another rope is needed to pull the operating rope into place. Four commonly used beckets are illustrated. The rope end must be fastened to the mechanism so that force and motion are transferred efficiently. End terminations thus become items of great importance for transferring these forces. Each basic type of termination has its own individual characteristic. Hence, one type will usually fit the needs of a given installation better than the others. It should be noted that not all end terminations will develop the full strength of the wire rope used. 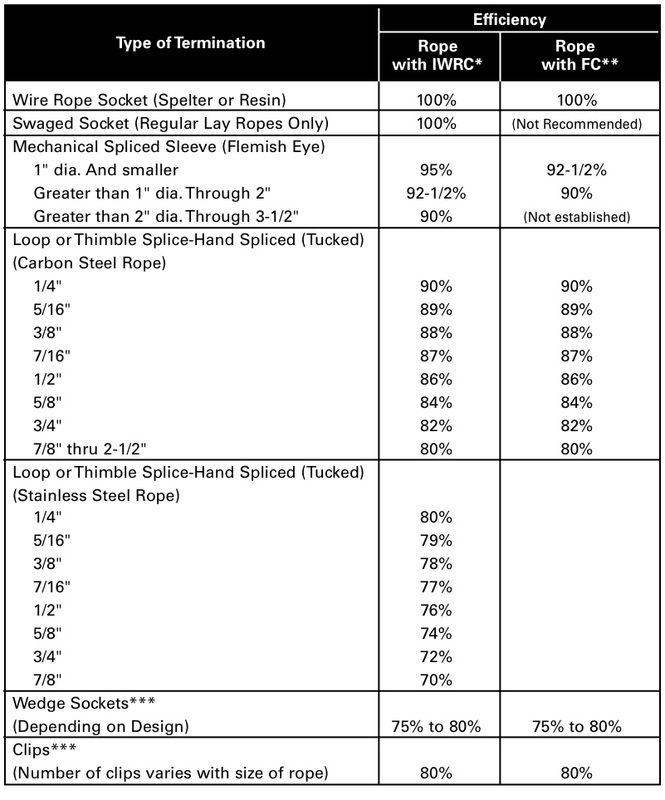 To lessen the possibility of error, the wire rope industry has determined terminal efficiencies for various types of end terminations. Holding power calculations can be made for the more popular end terminations based on efficiency factors in Table 5. End fittings or terminations are available in many designs, some of which were developed for particular applications. The six shown are among the most commonly used.based on efficiency factors in Table 5.